Looking for brand-names at discounted rates? In the professional garment buying industry? Then Cheung Sha Wan Road is for you. If your interest is only in retail then there may be options for you as well, but this is principally a professional purchasing destination. Sales here are not because of seasonal stock clearance, but because these outlets are working with bulk quantities. However bulk is quite small as they are also experienced with working for buyers from small boutiques that visit from around the world. Purchase 10 or 20 of an item here at a few percent of retail costs. There are treasures to be found here because many factory buildings originally did manufacturing in the area. Some small manufacturing is still done but the majority of course is done in factories over the boarder in mainland Chinese. Take care that as well as regular bulk sales some shops are also dealing in end of line, excess and reject items. While these will have excellent pricing the buyer needs to know what they are dealing with. 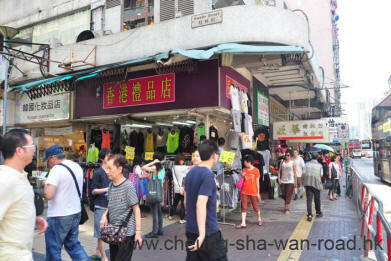 Local office workers sometimes visit these shops to get the great discounts, doing bulk purchases with their friends. Hence the shops are familiar and willing, subject to signs typically hung in the shops, to do small wholesale or multiple-retail type sales. Small stocks are held in the shops themselves but for larger quantities purchasers will have to wait while messengers collect material from nearby warehouses.